A storm that rolled through the East Valley on Sunday left its mark in a number of ways. It hit hard and fast late Sunday afternoon, leaving thousands without power and residents cleaning up. The storm brought with it strong winds, rain and even hail. 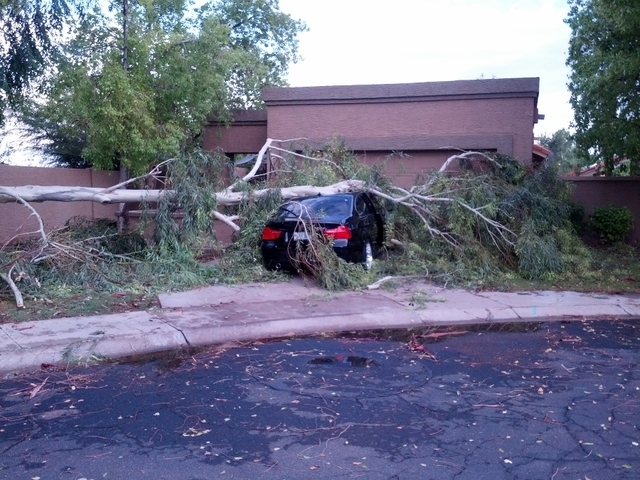 It was a common sight in Mesa, Chandler, Gilbert and Tempe to see fallen trees across streets, yards and even across vehicles. One viewer sent a photo of his neighbor’s trampoline that had blown over a fence into his back yard. Power went out for about 7,000 customers with Salt River Project and Arizona Public Service. By 9 p.m., only a few hundred were still without. Neighbors at one Mesa apartment complex worked together to clear away a massive tree blocking their way out. One family in Chandler is looking for another place to stay tonight after a huge tree in front of their house toppled onto their roof.